‘The Walking Dead’ Season 5 Spoilers: Who Dies in the Finale Episode – More Than One Death? Favorite Principal Character Deaths: Gale’s statement could mean the death of the pampered citizens of Alexandria, but it could also mean Rick and our group favorites are at risk. With the finale being increased to 90 minutes, it promises to be packed with conflict as Jessica gives Rick her blessing to kill her abusive husband, Pete. There is a strong possibility that Pete will die. Thanks to a sneak peek, viewers are teased with Carol pulling her knife on Pete while delivering one of her casseroles. It’s a deliciously dark moment for Carol’s character who has evolved into one of the shows respected badasses. Rick, Carol, or maybe Jessica finally taking matters into her own hands – it’s a safe bet Pete will die. Comic book fans are also worried about Glenn. During a previous episode, the loveable character held up a baseball bat. It may seem rather innocent to those who haven’t read the books, but those who have immediately thought of Negan. Negan is a wicked and disturbed character who make The Governor look like a Disney villain. It’s a bit early based on the timeline of the books the show seems to be sticking to, but you can’t deny the foreshadowing of Glenn’s death. The “W” Mark: Most fans who have read the comics have picked up on all the references to The Wolves. From the warning spray painted on the wall at Noah’s old home town – WOLVES NOT FAR, to the WOLF FIGHT emblazoned on the back of the comic book Carl discovers in his new home in Alexandria, it’s undeniable there is something to the presence of wolves. TWD fans are also seeing increasing amounts of walkers bearing a W carved into the skin of their forehead. Spoilers from the comics will know this likely the introduction to a hostile group of survivors who make an appearance in Kirkman’s written graphic novels – The Scavengers. The group is led by a lunatic named Derek who kill without question and loot to survive. Their goal – kill Rick Grimes. Lucky for TWD graphic novel Rick – Andrea is still alive at this point and saves him with her sharp shooting skills. Andrea may be long gone in the TV version, but let’s not forget Sasha and her need for blood at this point. Morgan: This character saved Rick’s life in the beginning of The Walking Dead and has made a few appearances in the show. When we last saw him, he had tracked Rick to the church where Father Gabriel began his shame spiral. He found the note Abraham left Rick with an outlined path to Washington. Beyond that, it’s unclear where Morgan wandered. Could Morgan have turned into a sick, twisted killer? Doubtful, but Robert Kirkman did state during an interview with EW the show has “big plans” for Morgan. The character has been sparse throughout season 5, but maybe he will be a key player in the season finale. What do you think will happen in the season five finale of ‘The Walking Dead’? Let us know what your predictions are in the comment section below! The Walking Dead Spoilers Season 5 Episode 2 Video Preview Synopsis – What Questions Get Answered? 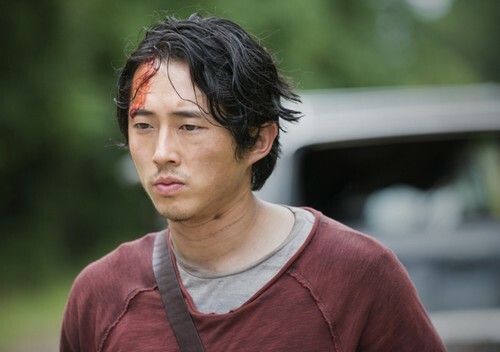 The Walking Dead Season 5 Spoilers – Glenn Dies – Death Coming Soon? The Walking Dead Season 5 Midseason Finale Spoilers Synopsis – Beth Dies And How We Know! The Walking Dead Spoilers Season 5B: Who Dies in the Second Half? The Walking Dead Season 5 Spoilers Finale: Alexandria Beyond Saving – Looks Like It Might Be?